Chrome plating adds only about 15-20 % to the cost of a typical screw and it provides so many benefits with almost no performance disadvantages. Yet many processors opt not to go with such screws. Although most processors are familiar with chrome-plating, there is an important specification to be considered in purchasing a chrome-plated screw or having a repaired screw chrome-plated. The critical specification is the depth of the plating. It is not enough to plate a screw with less than .02 mm (referred to as “flash chroming”). 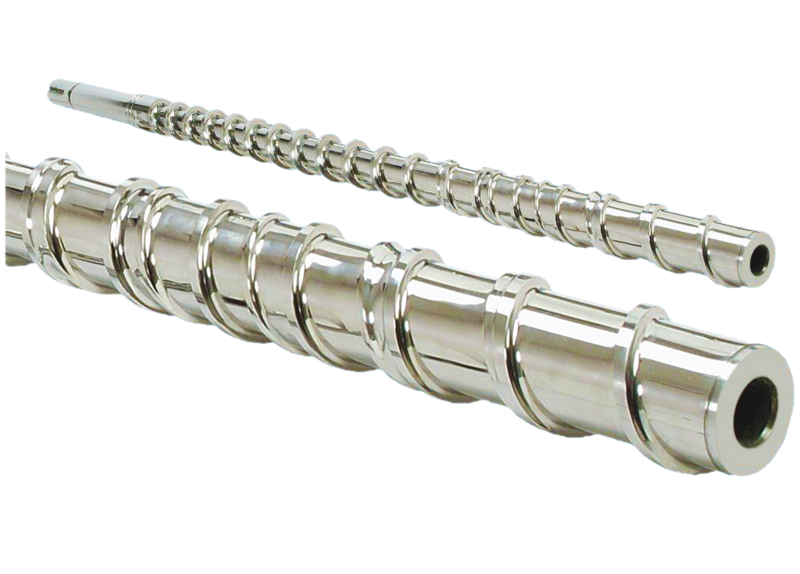 Flash chromed screws tend to nick and then peal off into the resin causing reject parts and opening the screw to severe wear to the unprotected, typically, soft 4000 series alloy steel. Chrome-plating should be at least .007 mm to .12 mm dia metricaly thick and guaranteed by your supplier. Such screws are mainly to be used for the corrosive and other free flow material, because chomre plating screw lots of cause of burning problem and degrading problem can be solved. Thus this type of screw to be in process of RPVC or PC materials, where degrading is the major issue. Sanity International provide such screw mainly to be use for PC where we do bimetallic coating on the screw and later on we process of the chrome plating so that this combination of screw gives much more better life and troubleshoot issue of burning and degrading. There are two basic kinds of chrome plating. That which is used on an automobile bumper, for example, is called decorative plating and is relatively soft. The kind used for screws is called hard chrome or industrial chrome. Hard chrome has a hardness of 65-69 Rc, which is equal to the hardest tool steels. For screw plating, the coating is typically about 0.025 mm. thick and does not materially affect the geometry of even the most critical dimensions. Additionally, it has a bond strength of approximately 6000 psi when properly applied, so it almost never comes off due to abrasion. That said, chrome plating is not suitable for the tops of the screw flights, where the stress can easily exceed 6000 psi. During the plating process, screw flights are almost always masked off. Chrome plating provides a good corrosion barrier to everything but some acids formed by the degradation of certain polymers. Acids do not actually affect the chrome, but hard chrome inherently has micro cracks. Acids can seep through the cracks and get under the chrome layer to corrode the bond. These cracks are impossible to see with the naked eye but are readily visible under magnification. Most of the time this risk can be addressed by applying chrome in several thin layers so the cracks do not intersect, thereby providing a largely impervious surface. That treatment is often used on rigid PVC processing equipment and is referred to as double or even triple chrome. It requires a series of separate plating treatments and cannot be duplicated by simply applying a thicker coating. The simplest and most common reason to chrome plate screws is that they do not rust while in storage or during shipping. To prevent rusting during those periods, it’s necessary to coat non-chromed screws with a temporary protective coating, which is messy to put on and even messier to take off. The inherent smoothness and lubricity of polished hard chrome makes it much easier to clean screws, either manually or by purging. Hard chrome can be polished to <0.5 Ra, which is a true mirror finish, and in that form has a coefficient of friction (COF) less than one-quarter of that of polished steel. During periodic cleaning, it’s common to use wire brushes and various scrapers. Hard chrome resists abrasion from these tools, which often roughen the surface of uncoated steel, making for shorter and shorter cleaning intervals. Additionally, the inherent lubricity of chrome reduces its bond to the polymer, making it easier to remove. Hard chrome is effective in preventing abrasive wear from many of the fillers used in polymers. Because of the combination of high hardness, low COF, and good lubricity, low loadings of even very hard materials like calcium carbonate or titanium dioxide will not readily damage hard-chrome plating. However, as loading percentages increase or even harder fillers are added, a somewhat more aggressive wear mechanism develops, requiring more sophisticated and expensive surface-protection coatings. But ordinarily the low COF and lubricity of polished chrome can improve the extruder’s feed rate, which governs the output of the screw in many cases. can be increased and made more consistent. Additionally, the higher lubricity of chrome plating reduces the tendency of polymer to stick to the screw in the solids feeding area Chrome plating has been known to eliminate the need for screw cooling with polymers that have a tendency to stick to the screw in the solids area when it is hot and not rotating. Simply put, hard-chrome plating is a very cost-effective solution to a lot of problems encountered during the life of the screw.